For awhile, this was a favorite winter lead of mine. Having climbed this easy Coast Range summit many times, and wishing to provide a lot of hikers with a mountain ascent as a first for the year, I began running these trips for the local chapter. From 1984 to 1986, on or about New Years Day, we'd do it. The air is clearer in the winter, one can hardly get lost, and there are plenty of spots to turn back for weaker people. I love the Napa Valley. It has maintained a fairly rural charm, and grape growers can run their vineyards producing the world's finest wines. I don't usually drink, but the idea of champagne on the summit of a mountain as a celebration of the new year appealed to me, and many others apparently. We would always stop in Calistoga, CA. This quaint town is the gateway to this hike. Many coffeeshops and restaurants make it a nice place to visit. It is in a far corner of the Bay Area scene, with farmworkers and retirees. Some art galleries, and a Disney-related museum, grace the streets. Mt. St. Helena has a state historic monument near the start of the hike. Robert Louis Stevenson State Historic Park is a normally obscure feature, with only a stone carved block to mark the site. He apparently lived here for a short while in the late 1800's, and was a famous author of adventure novels. Treasure Island and other works place him in a classic position in American Literature. I have no connection to this, other than being a peak climber. English was never my great subject. The hiking groups were sometimes large, and we gathered at the big dirt parking area at the high road summit of Highway 29. A pleasant forest trail leads to a dirt road, which continues to the summit. As a leader, you have to inform persons of the required hiking ability to get to the top. It is listed as 5 miles one way, with over 2,000 feet gain. I had erred on the stats for a long time, since it is so easy, for me and others, that I didn't think exact numbers were important. But yes, there are weaker hikers who have to carefully allot their strength to complete what is only a two hour hike, to the top, for myself and friends. Hiking through Douglas Fir, Madrone, and perhaps California Buckeye, it is a forested beginning to switchback on trail and turn a corner to the historic site and mine. "Climb the mountains and get their good tidings," said John Muir. "Your cares will fall away like autumn leaves." This was hardly ever so truer for me, while being on this hike. Once I attracted over 25 hikers. It was impossible to keep track of everyone. I had to announce to the group to stay together by carpool. The thing to avoid were hikers left on the mountain, or without a ride home. The trail gets rocky and rougher past the stone monument site, and less capable hikers will turn back. Once reaching the main dirt road, it is easy graded dirt road, all the way to the top. The road winds about the densely brushy slope, passing Bubble Rock, where rock climbers will test themselves, and then under other cliffs and rocks where I joined my first Sierra Club rock climb in 1971. The road tops at a saddle, with one side road going back left to the southwest summit, which is lower. This southern point now has a viewing platform and vista panorama, with San Francisco visible on a clear day. Due now to EMF radiation hazards, the south summit area is fenced off and posted closed. I would take the group to the highest point, which is the furthest, northeastern peak, with its radio or microwave towers and structures. Generally having lunch on the summit, I packed up a bottle of chilled champagne and clean plastic cups for everyone that wanted a sip. I am in the mood, for the first peak of the year. Currently, I have completed 24 ascents (2011). At the Bancroft Library at the University of California at Berkeley, an archived register book dates back to the late 1800's. This was once quite a worthy, Sierra Club hike. To the south are the Palisades, not to be confused with the 14,000 foot Sierra peaks. These cliffs and hills are now part of a new hiking corridor. A newly built trail runs along the top of them. The view to the north is of largely undeveloped land, verdant green. 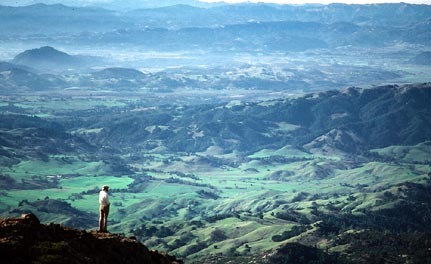 The geothermal energy facility, the Geysers, is seen from Mt. St. Helena's northeast summit. Snow Mountain is visible almost directly north. Lassen Peak and the Northern Sierra can sometimes be seen above the Valley fog, if there is any. Some say you can see Mt. Shasta, but I've found that's ignorant hikers mistaking Lassen Peak clearly to the northeast. This fine day, we were visited by a solo glider, wafting high on the thermals. I had snapped many photos, as hikers ooh'ed and aww'ed. The pilot kept coming close by, to see us, I suppose. On many hikes, before we'd return to the cars, a stop at Bubble Rock was in order. We'd watch rock climbers in the warmer afternoon. Ropes can be set at a tree anchor, with a sling and biner, or a pulley at the top. 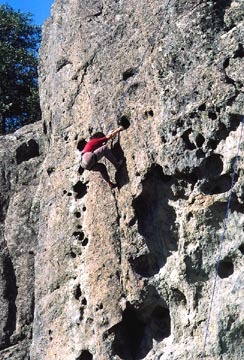 Belay stances are from the road. Falls are not so severe that lower belay anchors must be set, apparently. The climbing is on pockets and some cracks, all on an overhanging wall. It can be very strenuous. I have never tried it, not being able to find a partner when I was capable. My muscular weakness prevents most of that now. I haven't heard that there are any easy routes, below 5.5, say, that I would have tried, either. Carpools were free to do as they wished after the hike. There are plenty of wine sampling opportunities at the many wineries. I haven't heard of any bad things vis a vis any leads of mine, or any other Club trips here. I imagine everyone had a good hike, and all made it safely home.